A tennis ball is a ball designed for the sport of tennis. 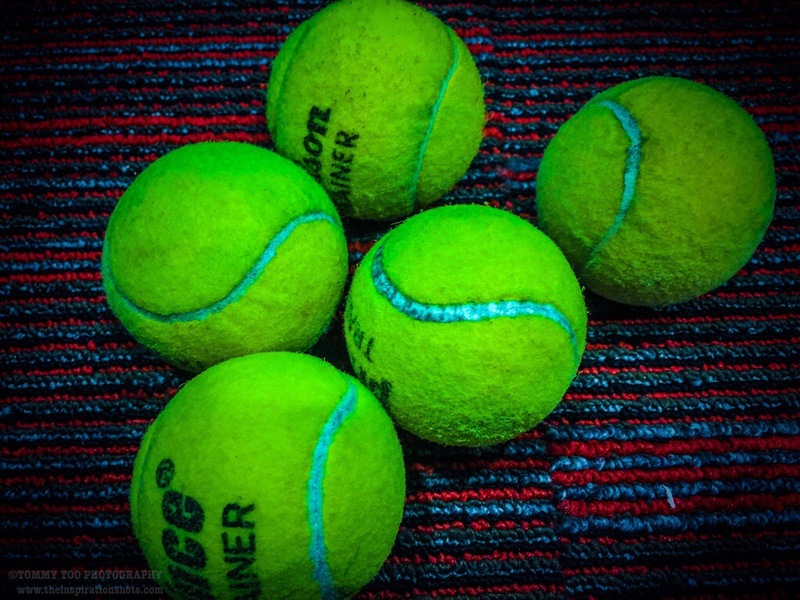 Tennis balls are yellow at major sporting events, but in recreational play can be virtually any color. Tennis balls are covered in a fibrous felt which modifies their aerodynamic properties, and each has a white curvilinear oval covering it. Before the development of lawn tennis in the early 1870s, the sport was played as the courtly game of real tennis. England banned the importation of tennis balls, playing cards, dice, and other goods in the Act of Parliament Exportation, Importation, Apparel Act 1463. In 1480, Louis XI of France forbade the filling of tennis balls with chalk, sand, sawdust, or earth, and stated that they were to be made of good leather, well-stuffed with wool. Other early tennis balls were made by Scottish craftsmen from a wool-wrapped stomach of a sheep or goat and tied with rope. Those recovered from the hammer-beam roof of Westminster Hall during a period of restoration in the 1920s were found to have been manufactured from a combination of putty and human hair, and were dated to the reign of Henry VIII. Other versions, using materials such as animal fur, rope made from animal intestines and muscles, and pine wood, were found in Scottish castles dating back to the 16th century. In the 18th century, 3/4 in (1.9 cm) strips of wool were wound tightly around a nucleus made by rolling a number of strips into a little ball. String was then tied in many directions around the ball and a white cloth covering sewn around the ball. In the early 1870s lawn tennis arose in Britain through the pioneering efforts of Walter Clopton Wingfield and Harry Gem, often using Victorian lawns laid out for croquet. Wingfield marketed tennis sets, which included rubber balls imported from Germany. After Charles Goodyear invented vulcanised rubber, the Germans had been most successful in developing vulcanised air-filled rubber balls. These were light and coloured grey or red with no covering. John Moyer Heathcote suggested and tried the experiment of covering the rubber ball with flannel, and by 1882 Wingfield was advertising his balls as clad in stout cloth made in Melton Mowbray.